All of the original guns. 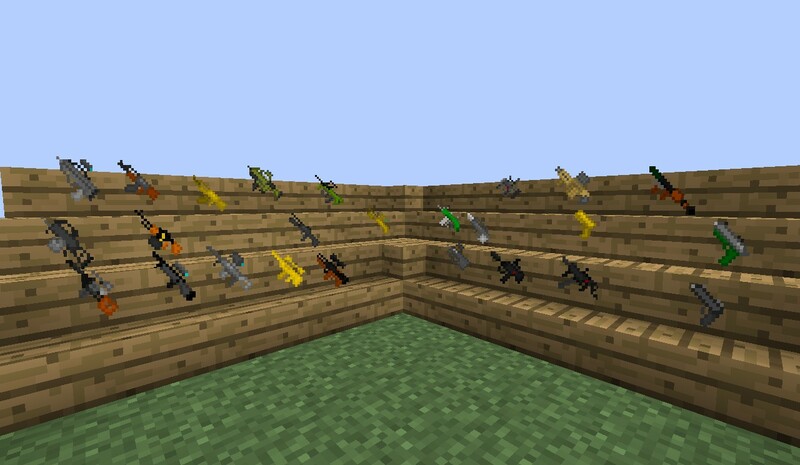 These are just some guns I added to the game with Heuristix's "TheGunMod"
I'M TOTALLY UP FOR GUN SUGGESTIONS! If you could help me get sounds though, that would be awesome! They are extremely hard to find. THIS IS NOT MY MOD. I CANT CHANGE ANY THING OTHER THAN THE GUNS. I WOULD LIKE TO. ALSO! Could you complete this Survey when you have used the mod? Although you can have HD textures, I did mine in the standard 16x16 so there was less hassle. *Golden Guns are meant for moderators and ops. Q- Does this require Modloader? A- Yes, in a sense. Heuristix's mod needs it to work, or you couldn't use the guns, but if you mean you need to download modloader to use these, then no. You just need to have Heuristix mod to work to use them. Q -Does it require AudioMod? Q- How do you install this? First Down Load ModLoader, Then ModLoaderMP. Then Install ModLoaderMP, followed by TheGunMod. The README.txt in TheGunMod tells you bluntly what to do. After Installing that, you should now have a folder named "heuristix" In your .Minecraft folder. Open that and put in the all the files found in the "Weapons" Folder. After that you should be done with the hardest part. So just play minecraft and go to a creative mode map to make sure it worked. After that, come back here and download my guns. 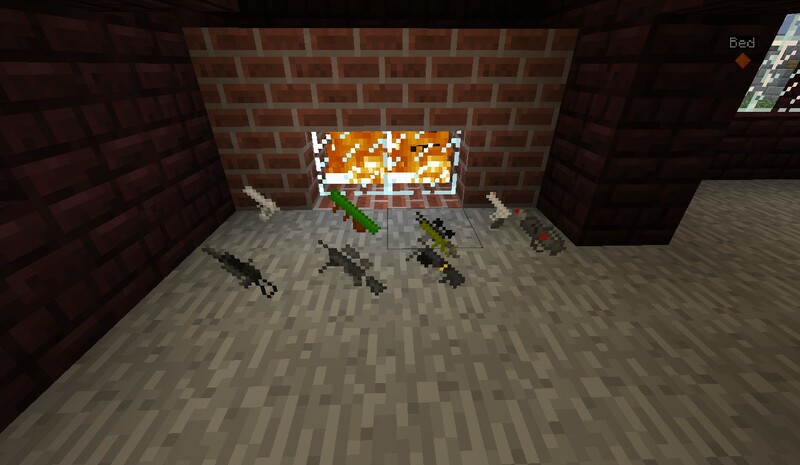 Go to your "heuristix" folder in your .minecraft and take out the guns found in the guns folder, and replace them with mine. Q - How do you craft the guns? All guns and ammunition ,minus the golden guns, belong to their rightful manufactures. I do not take credit for this mod, it is not mine. 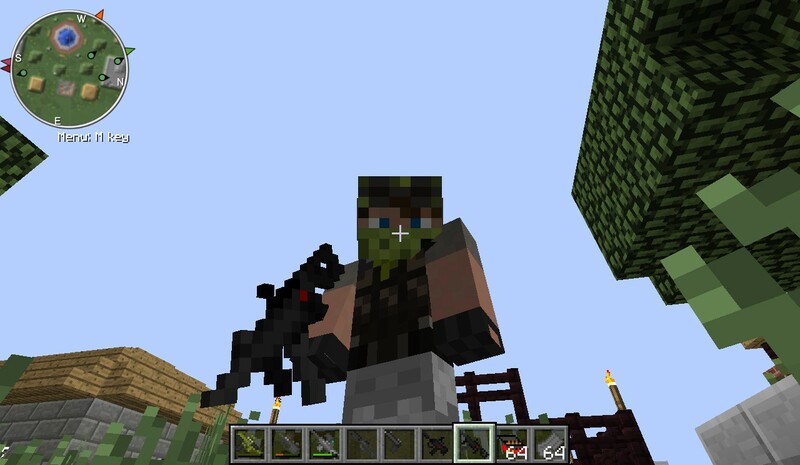 This is just an addition to "TheGunMod", this mod belongs completely to Heuristix, I just added more guns. In order to use these guns, you will need to delete the default guns (or you could just put them in a "Default Gun" Folder if you want to keep them). You need to delete them because they use the same Item ID code as the default guns. Added a few more guns. Wow, 1.3.1? are you crapping me right now? i dont understand "THE MOD IS DEAD" does it mean that the mod doesnt work anymore? maybe add a cz-805 BREN? 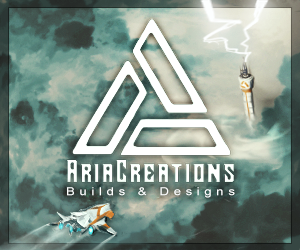 i greatly appreciate you making us this wonderful mod and hope for future developments. the mod is dead wtf? What update is it for? Dude! You should help with Flan's gun mod because he is Up-to-date! M14 and the Barret 50. Cal. 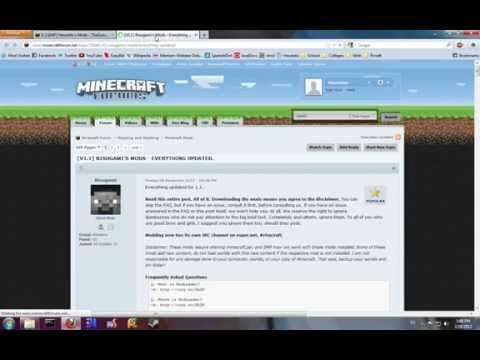 i cant find the current version for modloaderMP please help! What about the LAW? It is a tracking bazooka. is this compatible with forge? how about an FN FAL? Does this work with all the versions , only the heuristix mod has to be the current version? Work it on 1.4.5 ??? its make my minecraft crashed in a second!!!!!!!!!!!!!!!!! add the barret 50.cal!!! Or the m14! Survey of My Better Guns for "TheGunMod"